By Ania Swiatoniowski, Resources Quarterly. The clean, crisp, and cold waters of the Labrador Current flow from the Arctic icebergs to the shores of Newfoundland. It is in these waters that Badger Bay Mussel Farms Ltd. grow their signature Iceberg SelectTM mussels, some of the finest mussels in the world. Badger Bay Mussel Farms has double reason to celebrate in 2013. It is the company’s 25th anniversary and they have also achieved organic aquaculture certification in February 2013. Newfoundland’s newly gained organic status certification is a first for mussel farming in North America. 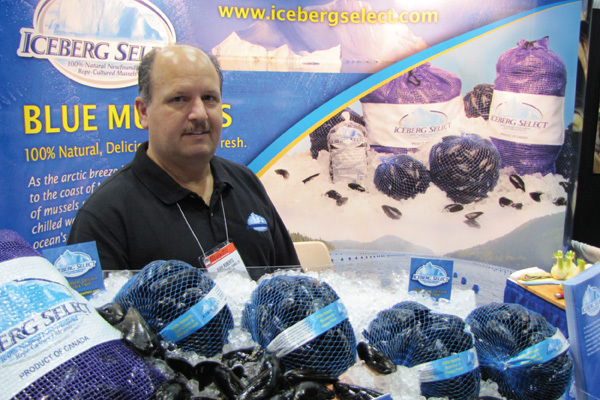 The Iceberg Select brand is the creation of Juan Roberts, president and founder of Badger Bay Mussel Farms in Triton, Newfoundland. These blue mussels (Mytilus edulis) are farmed along the northeastern coast of Newfoundland. Badger Bay Mussel Farms is a rapidly growing company and sells over 5 million pounds of mussels annually. 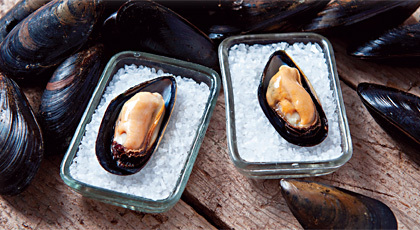 Fresh Iceberg Select mussels are exported as far as Alberta and the eastern United States. Frozen mussels are also exported to Asia. But Iceberg Select mussels are not your run of the-mill mussels. They are unique for several reasons. “The environment affects taste in mussels,” explains Roberts. “The clean, cold [Labrador Current] water gives them a sweeter taste. I guess the word I would use is succulent.” Roberts chose the name Iceberg Select because the Labrador Current is inundated with the water from melting icebergs. Over 2,000 icebergs pass the northern point of Labrador each year. The waters are on average 7-10°C colder than other coastal waters at similar latitudes, stimulating flavour and meat quality. This year, Badger Bay Mussel Farms have added another distinguishing quality to their product: organic certification. Newfoundland is the first to be certified organic for mussel farming in North America. Badger Bay Mussel Farms passed the rigorous bar of the Canadian Organic Aquaculture Standard and was granted organic status by the Global Trust Certification / SAI Global. Their sister company, Notre Dame Mussel Farms Inc., and their processing plant, Allen’s Fisheries Ltd., also achieved organic status. Maintaining organic status requires annual audits and re-certification by an independent third party in order to ensure standards are maintained. All stages of farming and processing must be documented and traceable. Materials used are also examined. In the process of honing his farming techniques, Roberts travelled to New Zealand to learn new methods for increasing productivity. 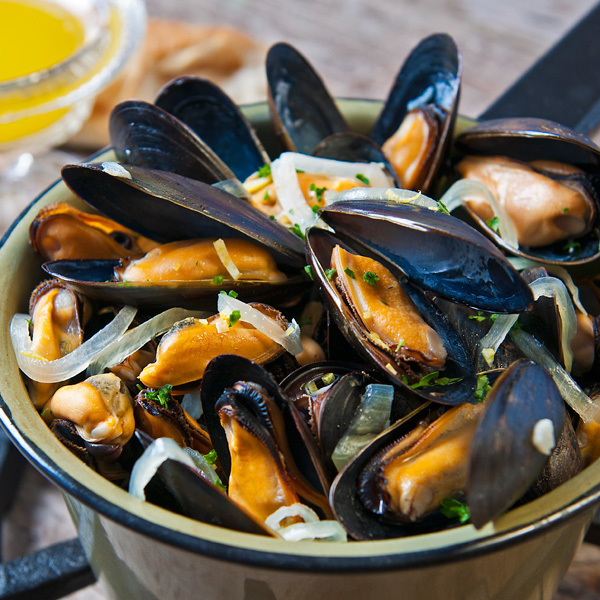 New Zealand is considered a world leader in producing environmentally sustainable mussels. It was there that Roberts learned ‘continuous socking’ technology. Badger Bay Mussel Farms was the first to use this sustainable and efficient method in Newfoundland. Mussel spat (larval seed) are caught on a collector rope (line) and are then stripped off and transferred to a second rope. This second rope, with spat applied to it, is then covered by a continuous socking, which covers the rope and spat like a sleeve. The Continuous Socking method uses one long rope (the second rope) that is placed in the water in loops at a length and depth that is determined by the grower and the conditions. The socking is made of a bio-degradable cotton material that dissolves within 1-2 months, leaving no waste. During those first couple months, the spat grows to a size where it can attach to the rope and the socking becomes unnecessary. The continuous socking method is quicker and less labour intensive. The socking also retains more spat leading to fuller harvests. Using bio-degradable materials during production is just one example of the extensive certification requirements. Farmers must also show that no synthetic chemicals or pesticide, have minimized waste, have considered local habitat health, and continuous movement toward improvement. Achieving organic certification is a major undertaking, but Roberts states with conviction that “It’s the right way to go”. Organic foods are good for human health and environmental health. But are also for markets. Consumers are increasingly demanding organic foods and high quality foods. “[Our organic certification] will allow people to choose this option if it’s important to them. It’s a healthy food and a premium product,” says Roberts. The newly-labelled organic Iceberg Select mussels were launched at this year’s Boston Seafood show. This is where Badger Bay Mussel Farms finds itself on its 25th anniversary. The milestone is not just a measure of time, it highlights just how much the company has grown. Badger Bay Mussel Farms was founded in 1988 by a 21-year-old Roberts with just the help of his wife, Sherrie, who is co-owner, his father, and one employee. Today, Badger Bay Mussel Farms along with its sister company Notre Dame, employs 20 individuals, 25 more are employed at the Allen’s Fisheries processing plant. Badger Bay Mussel Farms owns and operates their own farms, but also purchases mussels from two other Newfoundland growers. These mussels and those produced by Notre Dame Mussel Farms are sold under the Iceberg Select brand. With the purchase of the new farms, Badger Bay Mussel Farms is set up for 2-5 years of expansion. “The next step is to start farming, but you can’t rush into it”. He explains that sites need to be cleaned and upgraded so that they can start on the right foot. Part of the expansion planned for the next few years is to launch a new website promoting their organic status, projected to go online in fall 2013. Increased productivity also means creating more jobs and being able to turn part-time jobs into full-time jobs. CLICK HERE to view the Resources Quarterly featuring the 25th Anniversary of Badger Bay Mussel Farms and Iceberg Select.